Thick black smoke can be seen in the first video pouring from Hurtigruten’s Nordlys due to an engine room fire as it sailed along the Norwegian coast today. Passengers were evacuated safely. Later in the process, with the fire nearly out, the ship was brought alongside a pier in Alesund (Norway) this afternoon, which can be seen in the second video. The ship was listing about ten degrees to the port but was later stabilized. The complete story was carried in the September 15, 2011, edition of Cruise News Daily. Check this just-released video of Jan Schwiderek water skiing behind the 68,500-ton (GRT) cruise ship AIDAbella for more than six minutes to achieve a Guinness world record. The activity isn't quite ready for passenger participation just yet. 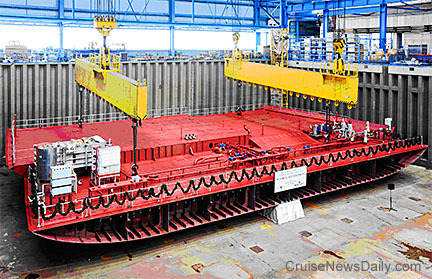 The last ship of Celebrity's Solstice class has begun to take shape. The first block of Celebrity Reflection was put into place today at Meyer Werft in Papenburg, Germany. The block is 20 meters long and 36 meters wide with a weight of approximately 500 tons. Celebrity Reflection is the fifth in the Solstice class. It is scheduled for delivery in November 2012. "It is possible to never forget as life goes on"
Ten years ago today, I was watching Good Morning America, from my home at the time in the Midwest, thinking about getting ready to go to my office when Diane Sawyer and Charlie Gibson began reporting on the events which were beginning to unfold in New York. As more and more became known, and then other tragic events occurred, I was glued to the TV. There was no point in trying to be on time going into my office. I doubted anyone in America was in theirs to be calling me. As time passed that morning, I began to think about what I should do. Was there really any point in publishing Cruise News Daily that day? Who in their right mind was going to be interested in reading about a cruise line's new itinerary or some other now-insignificant event in the cruise industry? I finally decided that it was my job to go to the office sometime that day and put out an issue. I concluded the right thing for me to do - for everyone to do - was try to make life again as normal as possible. I still subscribe to that theory, and each time I talk about it, I'm still a little unsettled. By making things "normal" I don't want anyone to think I'm saying we should try to forget what happened on that day, but neither do I want to dwell on it. Life and the world moves on, but we shouldn't forget the past either. It's a delicate balance. This week, in a report for ABC News about a 9-year-old boy - who wasn't even born yet on 9-11 but is one of the people most touched by the violence - Bill Weir got it exactly right, when he said, "It is possible to never forget as life goes on." And this almost-10-year-old shows us how.